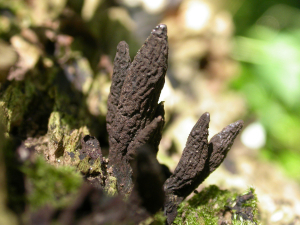 Observation - Dead Man's Fingers - Global. Description: Not the marine soft-coral but an obscure fungus. I know nothing about it apart from that it is in the flask fungus group. This one is I think the largest one in the UK, at about 3 cm tall, although there are much larger ones in the tropics. Not the marine soft-coral but an obscure fungus. I know nothing about it apart from that it is in the flask fungus group. This one is I think the largest one in the UK, at about 3 cm tall, although there are much larger ones in the tropics.